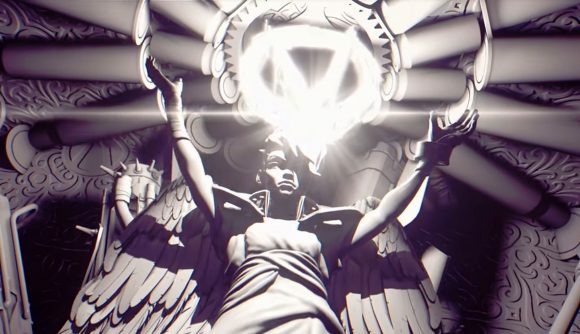 A Borderlands teaser trailer just went live. It doesn’t actually say ‘Borderlands 3’ anywhere in it – not explicitly, at least – but that’s almost certainly what it’s teasing, and that’s not all. Turns out the trailer is full of secrets and easter eggs, including a code that can be redeemed for a skin and five golden crate keys in Borderlands 2. As the community has already discovered, this code can be used in Borderlands 2 to unlock the Salvador’s Community Day skin and five golden crate keys. There’s more, as a new video from eagle-eyed YouTuber Arekkz shows. A white spot starts flickering in the top-left corner at around 15 seconds, and it’s actually flickering in morse code. Arekkz put its signals through a translator and it spells: “count the sirens”. Borderlands fans will know that sirens are women with various powerful abilities, and Arekkz reckons he counts three during the trailer. Could this be a subtle confirmation that the trailer is indeed teasing Borderlands 3? More oblique still are the three lines of braille that appear in the bottom-right of the screen starting at 41 seconds, which translates to “follow and obey”. Arekkz is stumped and so are we, but this could relate to the plot of the coming game, and there’s plenty else in the trailer that might hint at this, too. We’re almost certainly looking at the four new Vault hunters at 23 seconds, while the way that the two new characters at the start of the trailer are posed throughout its duration suggests they might be the new villains. And just why are they posing under an inverted Vault logo? The trailer is full of more familiar faces elsewhere – check out our Borderlands 3 characters breakdown for a roundup. We don’t yet have a Borderlands 3 release date, but if this has got you hyped, you don’t have a long wait to learn more – Borderlands developer Gearbox is due to appear at PAX East tomorrow, and this trailer leaves little doubt as to what they might announce. The livestream starts at 11:00 Pacific (18:00 GMT).